me how quick it grows. Going to be stemmy but it will still feed well. Option might be to turn the cows in or sell some bird hunts. 1982vett wrote: Going to be stemmy but it will still feed well. Option might be to turn the cows in or sell some bird hunts. I cut it already as I needed some hay. Got to try to reseed the field this fall also. We fed plenty of pearl millet that was way to over mature when cut. The cows will clean it up. Last year I fed some 2 year old bales of millet that had been in the back of the barn. The cows ate it like candy. Should I have any worries about nitrates in it? tom4018 wrote: Should I have any worries about nitrates in it? If its not been in a drought you should have no worries. Don’t take this as fact but I’ve always read the nitrates are mainly stored in the bottom 3-5” of the stalk. I never tested ours for nitrates but I cut it at about 5” height with my haybine. I would not think nitrate poisoning would be a problem anyways unless you fertilized heavy and didn’t get a lot of moisture. I have never tested our sorghum sudan or millet for nitrates or prussic acid. I have always fertilized right after cutting and had plenty of rain. Usually a lot more moisture that I wanted. We always have ours planted back in oats or wheat before a frost comes that would stress the summer annuals. I treat Johnson grass with the same train of thought except I don’t mow it high. A lot of people hate Johnson grass but I actually welcome it. During dry weather it really keeps producing. Just rolled 39 rolls that had probably 50% johnson grass in them last week. I can promise the cows will eat that over straight grass hay. I just don't get the disdain for JG, I know it's a subject beat to death. If it's in a pasture it's the first thing eaten , that tells me something . If it's hay, all that is left is the stem, that tells me something too. Same thing with fescue, if it wasn't for fescue this part of the country wouldn't be anything but a rocky desert . It boils down to how you manage it , sorry for the rant. Many a cutting has been overmature, and the cows do fine . I made the mistake of making baleage out of late September Pearl millet that had gotten tall and stemmy....it tested awful (rfq 53). The cows picked thru it but didn't clean it up. Well it is in a bale. Hope it was not too high on moisture. Over 3 days on the ground with a couple teddings. My first experience with it and hope it’s not an expensive mistake. jdg wrote: I made the mistake of making baleage out of late September Pearl millet that had gotten tall and stemmy....it tested awful (rfq 53). The cows picked thru it but didn't clean it up. I’m glad you posted that. I had the same plans last summer but the guy that was supposed to wrap it for me kept feeding me a line of and never showed up. I thought it was a good plan but evidently I was wrong. It wasn’t September so that might’ve made a difference but it was definitely mature. 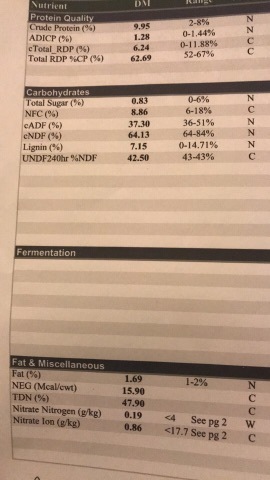 Got my test results back on the millet. Had to use a different lab and really trying to learn more, the other lab used RFV numbers. How bad is this? Right at 10% protein and 48% TDN. Protein is decent but TDN is low. Definitely edible though. For every 10 lbs they eat, they will get roughly 0.5 lbs of protein. Depending on what you’re feeding they will likely need some supplementation. Dry cows could possibly get by on it depending on how hard of a winter you have, assuming their intake is high enough. PM TB. He’s a wealth of knowledge on nutrition.